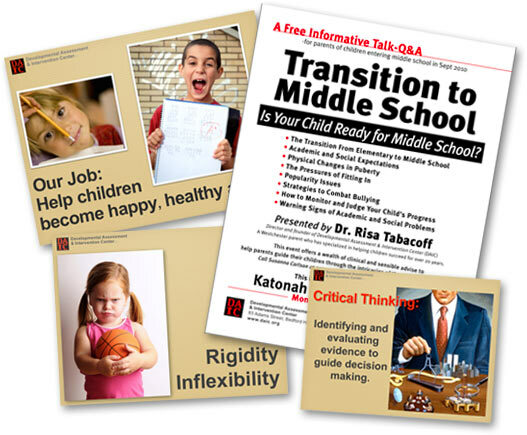 Addressing schools, professional groups, pediatricians, parent groups and more. Dr. Risa Tabacoff, Director of Services and founder of DAIC and her fellow psychologists at DAIC are serious about helping others and spreading information on issues related to psychoeducational testing, children’s issues, learning disability issues, early development screening and Adult-Mind MappingSM. DAIC’s experience can be a valuable tool for informing and enlightening audiences. Attractive, informative flyers, posters or email invitations available. Using beautifully designed, and captivating multimedia presentations these are only some of the areas of expertise available for speaking engagements. a speaking engagement for your group. At DAIC we’re experts at psychological and neuropsychological assessments and testing reports. If you have a report from another provider that you have questions about, or would like some explanation or a second opinion on, we would be happy to assist. We offer a 60-minute observation session at a child’s school by a caring psychologist. The objective of the session is to provide parents with specific expert information about their child’s social and emotional behaviors, including appropriate social interaction and areas for improvement. The observing psychologist, along with other child development specialists then evaluates, coordinates and creates an effective and easy-to-follow DAIC Behavioral Plan for the child, based on the observation session(s). Parents are then invited to a consultation session with the psychologist and the DAIC Behavioral Plan is reviewed and thoroughly explained. At this point, parents can decide to implement the Plan under the guidance of the psychologist or independently. Parents who wish to implement the DAIC Behavioral Plan can opt to participate in phone or face to face consultation sessions, where they are supported with additional guidance, information, and advice. The Observation Session is a prerequisite to this service. Please call or write today to schedule an appointment or to discuss any services you might need.